Darren Murray scored one goal and finished with two assists on Saturday. Pics by PressEye Ltd. It was a case of the contrast between perception and reality at Shamrock Park on Saturday. A casual glance at the 5-5 scoreline would suggest a classic Irish League clash that left fans thrilled as a fixture to live long in the memory. However, for those connected to the Ports camp, the Danske Bank Premiership draw offered little to savour as not even the sight of 10 goals could soften the sting of two points squandered. An inability to protect a two-goal lead in the closing moments exposed the defensive issues so often in the spotlight since Keith O’Hara’s absence. Although volunteers spent the morning clearing snow off the pitch, the Ports’ problems appeared based on Ballymena’s aerial threat rather than uncertain footing. Anthony Kane’s hat-trick of assists arrived off two free-kicks and a last-gasp hopeful punt from open play that left the Ports struggling to clear the danger. Allan Jenkins, Matthew Tipton and Johnny Taylor each provided a finishing touch and Ballymena’s first-half goals also suggested cause for concern. Tipton latched on to a sluggish clearance to steer a shot beyond David Miskelly before an unmarked Boyce smashed the ball home to keep the visitors in contention. The early talk of white snow and yellow footballs dominated the pre-match debate but the Ports finished feeling blue following the final whistle. It was a red-letter day, however, for Gary Twigg in terms of individual rewards. The ace marksman took full advantage of a return to the starting line-up to score three goals courtesy of delicate and decisive finishing. Portadown kicked off the scoring on three minutes when Twigg fired home Murray’s knockdown at the end of neat passing between Robert Garrett and Peter McMahon. Tipton hit back with an angled finish before McMahon steered a low drive into the corner of the net. Twigg’s second of the afternoon arrived to cap clever footwork and a disguised reverse pass by Murray. Boyce wrapped up the first half with a Ballymena strike as two former Portadown players, Gary McCutcheon and Tipton, linked up on the left and Miskelly saved Allan Jenkins’ initial shot but could do little to block the rebound. Twigg then displayed impressive pace to collect Murray’s flicked header and capitalise on the space created by Kane’s slip to wrap up his treble. Taylor cut the gap to 4-3 but Portadown appeared on course for victory when Murray rounded Stuart Addis and slotted into an empty net. 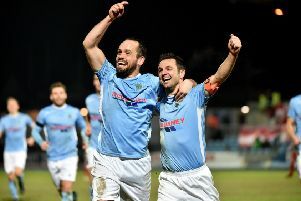 However, two goals in the frantic finale handed Ballymena a point - and left the Ports pointing to defensive concerns. PORTADOWN: David Miskelly, Chris Casement, Ross Redman, Chris Ramsey, Garry Breen, Peter McMahon, Sean Mackle, Darren Murray, Michael Gault, Gary Twigg, Robert Garrett. Subs: Billy Brennan, Paul McElroy, Matthew McMahon, Shea Conaty, Jordan Lyttle (on for Casement, 45 mins).